Just west of this point was the Southern Pacific terminus for the twenty-mule-team borax wagons that operated between Death Valley and Mojave from 1884 to 1889. The route ran from the Harmony Borax Mining Company works, later acquired by the Pacific Coast Borax Company, to the railroad loading dock in Mojave over 165 miles of mountain and desert trail. A round trip required 20 days. The ore wagons hauled a payload of twenty four tons. They were designed by J.W.S. 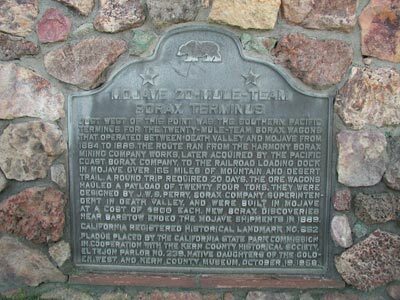 Perry, Borax Company superintendent in Death Valley, and were built in Mojave at a cost of $900 each. New borax discoveries near Barstow ended the Mojave shipments in 1889. 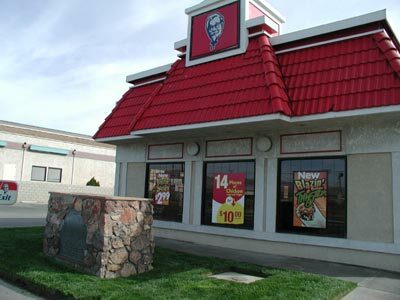 16246 Sierra Hwy (Hwy 14), Mojave.